Sweet potatoes should I harvest It's gonna get cold tonight? It is supposed to be down to 38 tonight than 37, 36 the following day's. Do you think i should harvest them today or let them go. Tomorrow it is suppose to be sunny so if there is damage tonight, tomorrow would be a better day I think. Is that too cold for them or can I risk it and let them go some more? Do an exploratory dig, not damaging the foliage and vines if you can help it. Harvest ones that are big enough to take. Try to assess if there are lots of smaller tubers or good % of tubers that are ready. If it seems like they could use some more growing time, and long range forecast indicates temps going back up for a while longer, cover the vines with double floating covers or old sheets, etc. (or layer of permeable fabric and a layer on top of plastic). Be sure to remove the covers if during the day depending on weather conditions. It's when the soil temp gets down in the... 50's? that you can lose the tubers to rot. That won't happen for a while as long as the daytime temp stays warm. You just need to protect the foliage from deep chill/frost. If it doesn't frost but the temps are going to stay cool, I would try to extend the sweet potato season with a plastic covered hoop tunnel so they can get good and hot during the day. Some weather stations are forecasting low of 38Ã‚Âº (not all however ) tonight or tomorrow night. I'll probably need to go through the same process. ...AND decide what to do with the tropicals in containers that have been vacationing outside. Thanks that is what I was thinking. It didn't get very cold last night I was a day ahead. It is supposed to be mid 30's tonight than upper 30's in the morning for 2 day's. But after that low's will in the 50's till the middle of the month. Than it is garlic planting time (first round). I think I will dig up the sweets in the garlic bed today because I want to work some manure into that bed so it has at least a little time to mellow out. gixxerific wrote: Thanks that is what I was thinking. It didn't get very cold last night I was a day ahead. It is supposed to be mid 30's tonight than upper 30's in the morning for 2 day's. But after that low's will in the 50's till the middle of the month. Than it is garlic planting time (first round). 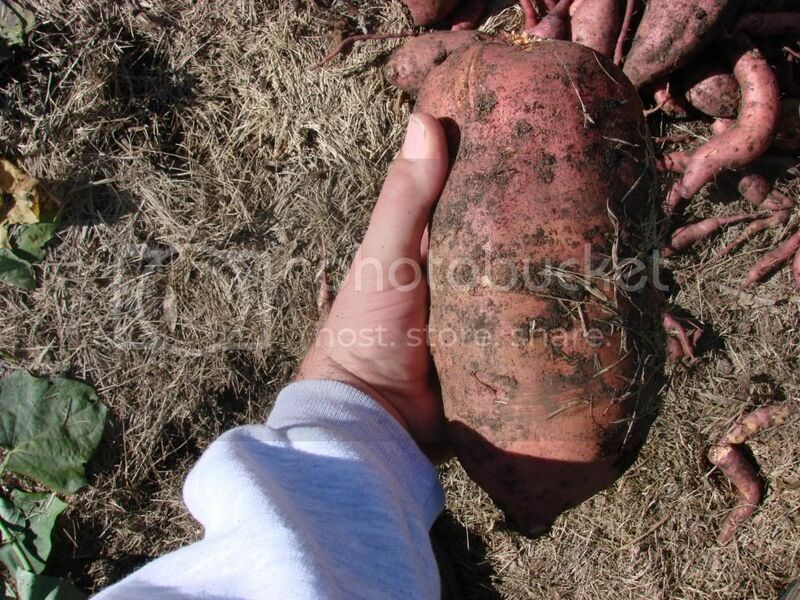 Be sure to check in with your sweet potato harvest . Hope you get some big ones! garden5 wrote: Be sure to check in with your sweet potato harvest . I got "A" big one. when do you harvest your sweet potatoes? Gonna be 25 degrees F tonight....will my stuff survive?